Posted by Jon in Hasbro, HASCON, Transformers with 0 comments. This year’s HASCON provided us with some information and our first look at some of the product roll out for the new Transformers line: The Power of the Primes! Hasbro has provided official imagery in addition to some details below for each of these new reveals. Were you like me and asking for Dinobots? Well fret no more as not only do we have the entire original team, but we also have a brand new female Dinobot Slash. That not good enough? Apparently they also combine! Crazy world we live in these days. Check out the official word from Hasbro, and check out the picture gallery below. The TRANSFORMERS: GENERATIONS POWER OF THE PRIMES MICRONUS PRIME MASTER figure is a 1.5-inch-scale figure that hides inside the included CLOUDBURST decoy armor (aka Pretender). The Prime Master robot can convert into spark mode and attach to a Power of the Primes Deluxe, Voyager, or Leader Class figure (Not included. each sold separately). The AUTOBOTS and DECEPTICONS use Prime Masters to wield the incredible powers of the legendary bots who shaped the universe: the Primes. The MICRONUS Prime Master gives other bots the ability to link and share powers. How will the AUTOBOTS and DECEPTICONS use this power-link ability? Anything is possible and everything is at stake when the Power of the Primes is unleashed! Available at most major retailers and on HasbroToyShop.com. AUTOBOTS unite around Hasbro’s TRANSFORMERS: GENERATIONS POWER OF THE PRIMES LEADER EVOLUTION OPTIMUS PRIME figure. This 9-inch-scale figure comes with a Matrix of Leadership accessory and converting Evolution Armor. Change the trailer into the Evolution Armor to evolve this figure from ORION PAX OPTIMUS PRIME. With the Prime Masters (Not included. Each sold separately), imagine AUTOBOTS and DECEPTICONS can wield the incredible powers of the most legendary bots in the universe: the Primes. Prime Masters carry the spark of a Prime, allowing them to share a Prime’s godlike ability with other bots. Anything is possible and everything is at stake when the Power of the Primes is unleashed! Available at most major retailers and on HasbroToyShop.com. 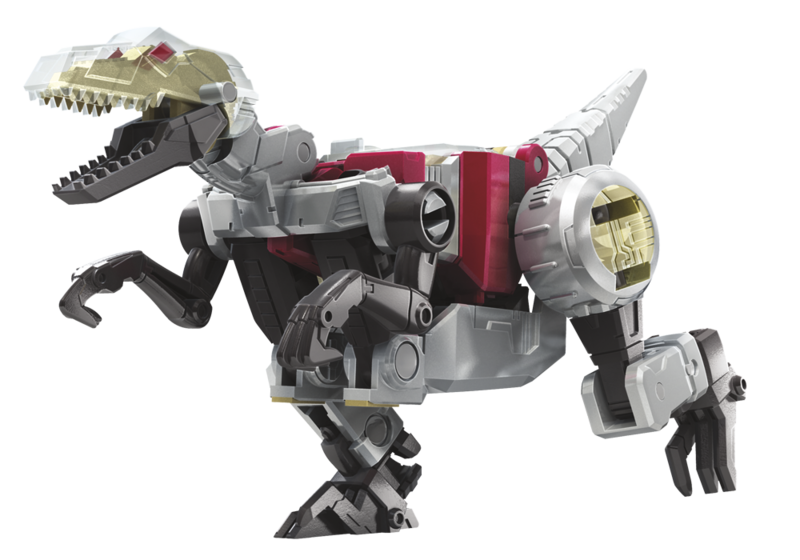 The leader of the DINOBOTS returns with Hasbro’s new TRANSFORMERS: GENERATIONS POWER OF THE PRIMES VOYAGER CLASS GRIMLOCK figure. This is a 7-inch-scale figure that comes with 2 Prime Armor accessories. Insert a Prime Master figure (Not included. each sold separately) into one of the accessories, attach it to the figure, and imagine GRIMLOCK wields the power of a Prime. The AUTOBOTS and DECEPTICONS use Prime Masters to wield the godlike powers of the most legendary bots in the universe: the Primes. Prime Masters carry the spark of a Prime, allowing them to share a Prime’s godlike ability with other bots. How will the mighty DINOBOT leader GRIMLOCK wield this epic power? Anything is possible and everything is at stake when the Power of the Primes is unleashed! Available at most major retailers and on HasbroToyShop.com. The TRANSFORMERS: GENERATIONS POWER OF THE PRIMES DELUXE CLASS DINOBOT SLUDGE is a 5.5-inch-scale figure that comes with a Prime Armor accessory. Insert a Prime Master figure (Not included. each sold separately) into the accessory, attach it to the figure’s chest, and imagine DINOBOT SLUDGE wields the power of a Prime. The AUTOBOTS and DECEPTICONS use Prime Masters to wield the incredible powers of the most legendary bots in the universe: the Primes. Prime Masters carry the spark of a Prime, allowing them to share a Prime’s godlike ability with other bots. How will the mighty DINOBOT warrior wield this epic power? Anything is possible and everything is at stake when the Power of the Primes is unleashed! Available at most major retailers and on HasbroToyShop.com. There’s no need to snarl at the new TRANSFORMERS: GENERATIONS POWER OF THE PRIMES DELUXE CLASS DINOBOT SNARL figure. This is a 5.5-inch-scale figure that comes with a Prime Armor accessory. Insert a Prime Master figure (Not included. Each sold separately) into the accessory, attach it to the figure’s chest, and imagine DINOBOT SNARL wields the power of a Prime. The AUTOBOTS and DECEPTICONS use Prime Masters to wield the incredible powers of the most legendary bots in the universe: the Primes. Prime Masters carry the spark of a Prime, allowing them to share a Prime’s godlike ability with other bots. How will the surly DINOBOT SNARL wield this epic power? Anything is possible and everything is at stake when the Power of the Primes is unleashed! Available at most major retailers and on HasbroToyShop.com. Fans can soar through the air with Hasbro’s new TRANSFORMERS: GENERATIONS POWER OF THE PRIMES DELUXE CLASS DINOBOT SWOOP figure. This is a 5.5-inch-scale figure that comes with a Prime Armor accessory. Insert a Prime Master figure (Not included. each sold separately) into the accessory, attach it to the figure’s chest, and imagine DINOBOT SWOOP wields the power of a Prime. The AUTOBOTS and DECEPTICONS use Prime Masters to wield the incredible powers of the most legendary bots in the universe: the Primes. Prime Masters carry the spark of a Prime, allowing them to share a Prime’s godlike ability with other bots. How will the fearsome bombardier DINOBOT SWOOP wield this epic power? Anything is possible and everything is at stake when the Power of the Primes is unleashed! Available at most major retailers and on HasbroToyShop.com. Watch out for the horns on this TRANSFORMERS: GENERATIONS POWER OF THE PRIMES DELUXE CLASS DINOBOT SLUG figure. This is a 5.5-inch-scale figure that comes with a Prime Armor accessory. Insert a Prime Master figure (Not included. each sold separately) into the accessory, attach it to the figure’s chest, and imagine DINOBOT SLUG wields the power of a Prime. The AUTOBOTS and DECEPTICONS use Prime Masters to wield the incredible powers of the most legendary bots in the universe: the Primes. Prime Masters carry the spark of a Prime, allowing them to share a Prime’s godlike ability with other bots. How will the fire-breathing warrior DINOBOT SLUG wield this epic power? Anything is possible and everything is at stake when the Power of the Primes is unleashed! Available at most major retailers and on HasbroToyShop.com. The fearsome SLASH is back with the TRANSFORMERS: GENERATIONS POWER OF THE PRIMES LEGENDS CLASS DINOBOT SLASH figure. This is a 3.75-inch-scale figure. When this LEGENDS CLASS DINOBOT SLASH figure is in raptor mode, Prime Master (Not included. Each sold separately) figures can ride on the figure’s back. The AUTOBOTS and DECEPTICONS use Prime Masters to wield the incredible powers of the legendary bots who shaped the universe: the Primes. Prime Masters carry the spark of a Prime, allowing them to share a Prime’s godlike ability with other bots. How will the elite DINOBOT tracker wield this epic power? Anything is possible and everything is at stake when the Power of the Primes is unleashed! Available at most major retailers and on HasbroToyShop.com.